This is a recent junk box lot pick up. It is what I believe to be a 1947 Rose Gold Bulova Douglas. It has a 14KT rose gold filled case with a copper dial with yellow gold applied hour markers and hands. It had a broken stem and missing a crown. I replaced it with a yellow gold one since rose gold ones are hard to find. Your watch looks like Douglas "A"
Thank you. So should I replace the hands with black ones To bring it back to original according to the ad? I agree with Douglas 'A'. You could source some stick hands to bring it back to the riginal appearance. Borel might have rose gold crowns, you need to know the tap size of the stem. I will do that. I did just buy a huge collection of Bulova parts and movements. It included hands and crowns. The problem is I never seem to find rose gold crowns. Additionally, NAWCC marts are a great source of vintage watches and watch parts. Check the website for a chapter near you. 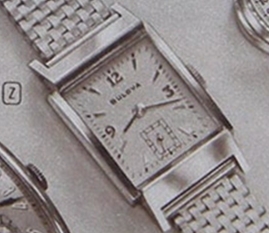 The Douglas (and Ambassador in 1949) ads show this design with two different hand styles. One of the styles is the same as what is currently on your watch, so your hands are likely correct. At $67.50, the pricelists show the Douglas 'A' with model# 38105; this same model number is assigned to the Ambassador 'F' and calls for case color of P (pink/rose) and the same price. I'm not sure if hand style is the difference, since you can find both styles on both models per the ads. Perhaps the model difference with the rose color case is having silver hands/markers vs gilt? Base on Ken's excellent research, I would that this is a Douglas. I would leave the hands as it sits, agreeing there is a good chance they are original. 1947 Douglas "A" works for me.